Elisabeth decided to define her own project. She became interested in the Golden Ratio. She came to me with a boatload of questions she wanted to tackle ranging from: 1) How can I create the Golden Spiral? to 2) Why is the Golden Rectangle aesthetically pleasing? I said, "yeah, that's some good stuff there. I trust you. Do it." Two days later, I sit down with her as she's working and watch her think. She has this perplexed look on her face as she is shuffling through her notes. She has about a half-dozen different rectangles sketched with different dimensions along with more questions than what she started with. She looks up and says, "The more I look through all this, I'm wondering, 'what's my question?'" That's right, Elisabeth. Don't ever forget that. This year, I decided to take a much more hands-off approach when it came to student projects. There were some homeruns, but there were too many swings-and-misses. Some students opted not to even step to the plate. I suppose that's what happens when students are offered more autonomy. But, I didn't do enough to prepare them to make decisions in such an open ended environment. I think I was too hands-off. For the final project, I gave my 8th graders seven choices; one of which was to determine the angle that would maximize the distance traveled by a projectile. Vertical and horizontal motion do not affect one another. 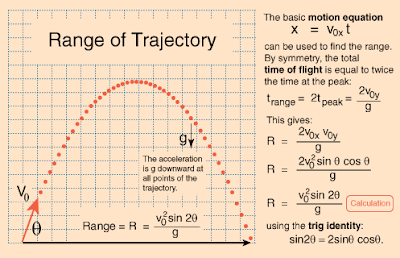 How vertical and horizontal motion work together to determine the path of a projectile. 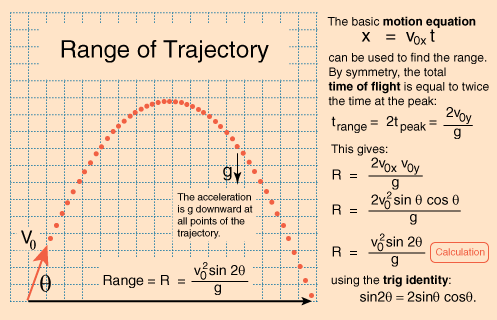 Last year I had students do an investigation on trig ratios prior to working with projectile motion. But due to a shortened school year and the fact that all of my students will be taking geometry next year, I had to cut something. It took a few short conversations for the group to get the fact that horizontal and vertical work together to determine the path and that they needed to use the vertical motion model to determine how long the ball would be in the air. From there, they could figure out how far it would go. But there was one problem: they didn't know how fast the ball was travelling which made it impossible to determine the vertical and horizontal components. Q: How fast is the ball travelling when it is hit? A: I didn't specify, did I? This led to a nice conversation on how we need to eliminate as many variables as we can. Solution: Pick a velocity and work with it. They chose 100 ft/sec. Q: So how fast is the ball travelling vertically and how fast is it travelling horizontally? So we took turns pushing Joey around the room from behind and the side simultaneously. Each time one person pushed harder than the other. Conclusion: If the person from the back pushes harder, Joey goes forward more. If the person from the side pushes harder, Joey moves to his left more. Then we talked about how the velocities can be modeled using vectors and we can use what we know about triangles. Since the forces are perpendicular, we have a right triangle. Q: If all we know is the hypotenuse of the right triangle, how do we find the other lengths? A: Is that really all you know? Solution: They settled on using a 45-45-90 since that is the only way they could figure out the other two sides. Q: But what do we do for other angles? A: Yeah, that's kinda tough, huh? Why don't you use a protractor to draw the angle you want, build the triangle you want and measure. Q: Can we use GeoGebra? They used an applet with a fixed hypotenuse of 100 and gathered data on the other two sides. Q: Is there an easier way? Complementary angles yield the same distance. My day begins at the door where I greet my students with handshakes and fist bumps. Her day begins with five little boys climbing into bed and dog-piling her. My lesson planning is done sitting at my desk. Her lesson planning is often done at the bottom of that pile. My lessons are informed by pacing guides, practice tests and proficiency levels. Her lessons are informed by bugs in the backyard, bicycle tires and brotherly conflict. My students use manipulatives to learn counting techniques. Her students count out baby carrots as they make Dad's lunch. I use rabbits to teach about exponential growth. She uses a persuasive essay so her students can decide if they really want a rabbit. My students solve fraction problems about baking and measuring. Her students cut recipes in half, measure and bake. My students eat lunch and go out to a treeless field for recess. Her students eat lunch in the tree. My classes end when the bell rings. Her classes end at bedtime. I use formative assessment to shape lessons. She uses formative assessment to shape lives. My students call me "Mister." Her students call her "Mommy." One of us teaches. The other pseudo-teaches. I had a copy of John Van de Walle's book on my desk the other day when a student asks, "Mr. Cox, what are you reading?" "Oh, this book on how to teach math. It's pretty interesting." "Oh, yeah? What's so interesting about it?" "Well, I like this chapter on Teaching Through Problem Solving. It mentions three different ways problem solving can be taught: Teaching for problem solving, Teaching about problem solving and Teaching through problem solving." "Well, teaching for problem solving is when students will learn a certain set of skills and then later be asked to solve a problem using those skills. Teaching about problem solving is when students learn about particular strategies for solving problems. And teaching through problem solving is when students are given the problem first and then they figure out how they want to solve it. It's kind of the opposite of teaching for problem solving." "Hmm. So teaching for problem solving means the teacher shows us how to do stuff first?" "They don't think we can think for ourselves? That's kind of offensive."